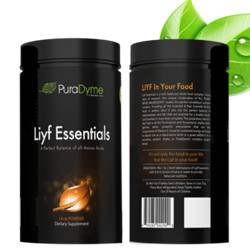 Liyf Essentials is the perfect way to ensure balanced nutrition! 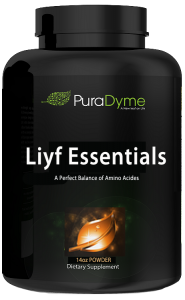 Unlike simple protein powders, Liyf Essentials is a whole-food, amino acid complex formulated for the promotion of energy, health, and longevity! Vastly superior, this product contains a complete profile of essential nutrients, including all 21 amino acids, that can be used to enhance the nutritional value of smoothies, dressings, and soups etc. Mix 1-2 level Tablespoons with 6-8 ounces of juice or water to provide balanced nutrition. Store in Cool, Dry, Place, Best Refrigerated. A. Amino Acids are the building blocks of proteins, and proteins are the building blocks of life! Every part of the human body relies on protein for proper growth and rejuvenation. Without a full spectrum of amino acids, proteins cannot function properly! In basic terms, there are amino acids that our body is capable of producing and amino acids that must be supplied by the diet on a daily basis. The amino acids that our body produces are called non-essentials, whereas essential amino acids MUST be consumed on a daily basis. These 8 essential amino acids are so important to our health that failure to get even one of them results in the degradation of the body’s proteins, muscles, etc. in order to get that critical amino acid. In addition, without these essentials, our body cannot manufacture the remaining non-essential amino acids it needs to function! A. Tocotrienols/ Tocopherols are nutrients belonging to the vitamin E family & play important roles in many of the beneficial functions of the vitamin, ranging from protecting cell membranes to combating free radicals! These nutrients have been proven to reverse Carotid Atherosclerosis, suppress Cancer & Tumors and assist in Cholesterol management. It also works as a super antioxidant. Supplementing with tocotrienols can also slow the effects of aging! Why do I need to Supplement Daily? A. Unlike fats and starches, amino acids cannot be stored by the body for future use. That is why they must be consumed daily. In fact, all amino acids must be present at the same time and in proper balance in order to be used properly. If all amino acids are not present or one is in a short supply, the body will only consume the present amino acids until the ones in short supply have been exhausted. Once that occurs, any remaining amounts of other amino acids go to waste. A. Why stress about finding foods with the proper balance of amino acids, enriched with high tocopherols and tocotrienols? Liyf Essentials takes care of that for you! This amazing product perfectly balances both essential and non-essential amino acids in a readily absorbable format that is tasty for you and loved by the body! Give your body the essential nutrients it needs daily in one simple step! By supplementing your diet with this whole-food amino acid complex, you will be one step closer to achieving a life of vibrance, energy, rejuvenation, strength and more! It’s not only the food in your life, but the Liyf in your food! Are Humans designed to eat animals?